Jon Albon is to obstacle racing what Usain Bolt is to sprinting. If you turn up at the start line of a Tougher Mudder or Spartan Race and see this affable 25-year-old smiling back at you, the best you can hope for is second place. Since he began obstacle racing in 2010, Albon has put together an incredible string of victories – from Rat Race’s Dirty Weekend to Men’s Health’s Survival of the Fittest, via The Grim Challenge and Norway’s notorious Telemarkshelten. He also found time to post a 2:32 road marathon, just to see what he could do when there was no icy water to wade through or 10-foot obstacles to hurdle. When I first started running, venturing off-road was all about school cross-country races, generally around anodyne playing fields in heavy football boots. It wasn’t the kind of experience that books are written about. In fact, it was the kind of experience that scarred many would-be runners for life. But fast forward, cough cough, a few years and trail running is now big business. The clamour for places in the ‘big daddy’ of all trail race, the Ultra-Trail du Mont-Blanc, is as fervent as the Virgin Money London Marathon and shoe companies now have entire ranges dedicated to trail and off-road. Why is it so popular? If you haven’t yet ventured off the beaten track, trail running is about being more in-tune with nature and taking stock of your surroundings. It’s not about times or even really distances; it’s about testing your body over different terrain with vistas to die-for! 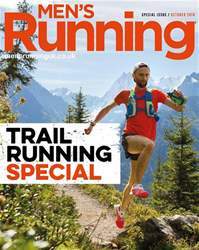 In this Men’s Running special, we talk about everything trail, from training to technique. We even cover a few races for good measure. We hope you enjoy!